Punch holes have long presented a problem in scanned documents. Removing punch hole marks from documents has always been a tedious, manual process. To compensate for this, an automated punch hole removal algorithm has been added to the already extensive feature list of the Black Ice TIFF SDK. 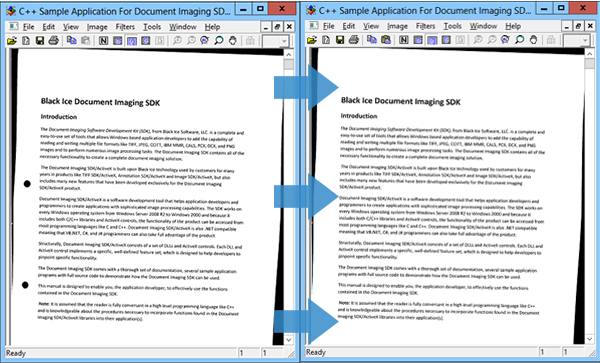 This powerful feature allows developers to create automated document imaging applications. It is a common problem that scanned images show the locations of the holes created by the hole puncher on the documents. Removing the black marks had to be done manually, for each page, by opening the image and erasing the black dots from the side of the image. This process was slow, time consuming and highly inefficient. The new RemovePunchHoles() function will automatically detect the location of the punch holes on the image, and will remove them in a blink of an eye. The function will work for most common hole puncher standards. It will remove the 3 and 5 hole marks created by the US hole punchers and also will remove the 2 and 4 hole marks created by European hole punchers. The function will automatically detect the DPI (resolution) of the image. As an advanced setting, for special cases, the diameter of the punch holes can be specified as a parameter. By combining the new punch hole remover feature from the TIFF SDK with automated document scanning will make the document image processing a fully automated task, which will not require any user interaction. Image processing functions are used to make images look better or correct and remove visual artifacts from images. These image processing functions are can be used together with filters and effects to produce better over all result. The Document Imaging SDK implements several image-processing methods that can provide solutions to problems that happen during image acquisition such as faxing, scanning and photography. Some of the most widely used features are automatic de-skew, automatic black border removal, punch hole removal, and despeckle or clean image, all of which are available in the Document Imaging SDK/ActiveX.